Articulate Engage offers many illustrated and photographic characters to add life to your interactions. Both male and female characters are available in a variety of styles, poses, and expressions. Engage comes with several illustrated characters and one photographic character. Additional characters can be purchased in the Articulate Store. Select the step where you want to add a character. Click the Character icon in the Media panel on the right side of the screen. (Note: For Media Tour interactions, the Media panel is in the middle of the screen.) Select either Illustrated or Photographic. When the character builder opens, choose a character, and select its attributes. For illustrated characters, select an expression, pose, and perspective. 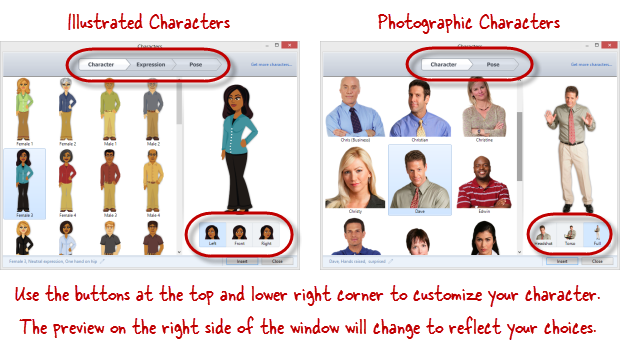 For photographic characters, select a pose and crop. As you make selections, the character preview pane on the right side of the window will update to reflect your choices. Click Insert to add the character to your interaction. Position: Choose where you want the character to display in your published interaction. Size: Choose Automatic or Custom. If you choose Automatic (the default option), Engage will adjust the size of the character, so that it fits within the allotted space in your published interaction. (Tip: Click here to see the maximum dimensions for media in each interaction type.) If you choose Custom, enter the Width and Height in pixels. 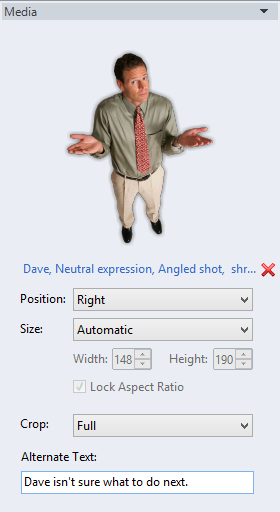 Mark the Lock Aspect Ratio box to keep the character from being distorted when you adjust its size. Crop: This option is only available for photographic characters. It lets you change how much of the character will display: Headshot, Torso, or Full. Alternate Text: Do your learners use screen readers? The Alternate Text field can help with that. Just enter text that describes the character, and screen readers will read it to your learners. If you change your mind about a character you inserted and you want to use a different one instead, click the blue text in the Media panel below the character (i.e., the name of the character). Then select a different character, and click Insert. 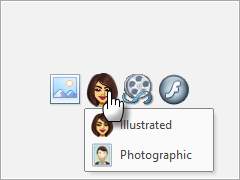 If you want to replace a character with a different media type altogether (picture, video, or Flash file), click the red X in the Media panel to remove the character. Then choose a different media type.